The moody R&B singer has shared his debut solo album. Corbin, the goth-crooner who went under the name Spooky Black, has released his first album. Mourn is a 10-track project that includes the single "Ice Boy." The whole thing is streaming below via Spotify and Apple Music. 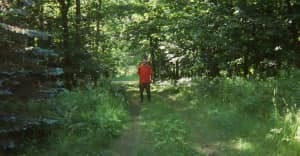 According to a press release, the concept for the album is "loosely based on the narrative where a reclusive male protagonist convinces his lover to move into a bunker in the woods due to the current state of affairs in the country. He then dies in a plane crash and she subsequently passes away after moving back home." Corbin teamed up with Shlohmo and D33J to produce the record in Los Angeles. Antwon and Blood Orange guitarist Ben Morsberger are also featured on the album. Later this month, September, Corbin will head out on a tour of the United States and Canada with Shlohmo and D33j. Tickets for the 16-date trek are available at CorbinShlohmoTour.com.